It was market day in Guernica when the church bells of Santa Maria sounded the alarm that afternoon in 1937. People from the surrounding hillsides crowded the town square. "Every Monday was a fair in Guernica," says José Monasterio, eyewitness to the bombing. "They attacked when there were a lot of people there. And they knew when their bombing would kill the most. When there are more people, more people would die." For over three hours, twenty-five or more of Germany's best-equipped bombers, accompanied by at least twenty more Messerschmitt and Fiat Fighters, dumped one hundred thousand pounds of high-explosive and incendiary bombs on the village, slowly and systematically pounding it to rubble. Those trying to escape were cut down by the strafing machine guns of fighter planes. "They kept just going back and forth, sometimes in a long line, sometimes in close formation. It was as if they were practicing new moves. They must have fired thousands of bullets." (eyewitness Juan Guezureya) The fires that engulfed the city burned for three days. Seventy percent of the town was destroyed. Sixteen hundred civilians - one third of the population - were killed or wounded. News of the bombing spread like wildfire. The Nationalists immediately denied any involvement, as did the Germans. But few were fooled by Franco's protestations of innocence. In the face of international outrage at the carnage, Von Richthofen claimed publicly that the target was a bridge over the Mundaca River on the edge of town, chosen in order to cut off the fleeing Republican troops. But although the Condor Legion was made up of the best airmen and planes of Hitler's developing war machine, not a single hit was scored on the presumed target, nor on the railway station, nor on the small-arms factory nearby. 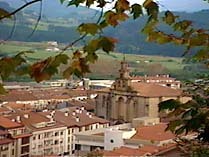 Guernica is the cultural capital of the Basque people, seat of their centuries-old independence and democratic ideals. It has no strategic value as a military target. Yet some time later, a secret report to Berlin was uncovered in which Von Richthofen stated, "...the concentrated attack on Guernica was the greatest success," making the dubious intent of the mission clear: the all-out air attack had been ordered on Franco's behalf to break the spirited Basque resistance to Nationalist forces. 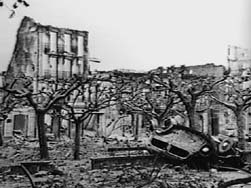 Guernica had served as the testing ground for a new Nazi military tactic - blanket-bombing a civilian population to demoralize the enemy. It was wanton, man-made holocaust. Note: On May 12, 1999, the New York Times reported that, after sixty-one years, in a declaration adopted on April 24, 1999, the German Parliament formally apologized to the citizens of Guernica for the role the Condor Legion played in bombing the town. The German government also agreed to change the names of some German military barracks named after members of the Condor Legion. By contrast, no formal apology to the city has ever been offered by the Spanish government for whatever role it may have played in the bombing.